If you need a reminder about the power of mother nature, then this video is it. A severe storm hit Salisbury in Maryland, US knocking down trees and damaging buildings as it swept through the city. But the real extent of its intensity was witnessed when powerful winds flipped over several cars outside a shopping centre. 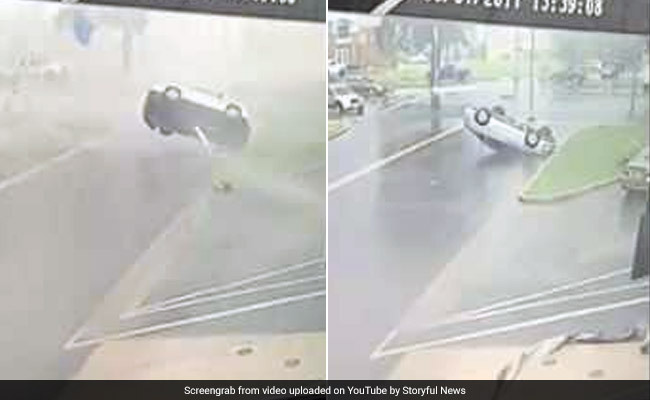 Video, caught on surveillance camera, shows a sudden gust of wind engulfing the driveway of the supermarket causing a white car to overturn multiple times before turning turtle. In another frame, a car parked right outside the centre is lifted off and lands on top of another vehicle. "Heard what sounded like a freight train above the store. Sounded like bulls were running across the roof. After that we came outside and everything was destroyed," a witness told CBS Baltimore. The driver of one of the toppled cars escaped with minor injuries. The National Weather Service said the storm was possibly a small tornado. Luckily, no injuries were reported, said local police department on Twitter.